When we think of invasive aquatic species, we often think of nonnative fish that invade our waters, but many invasive plants can cause harm as well. Michigan State University Extension has come up with a quick and easy guide for boaters and paddlers to use to identify certain plant species not native to Michigan that displace native plants, degrade lake habitats and ecosystems, and create problems for people who live on and use our lakes. 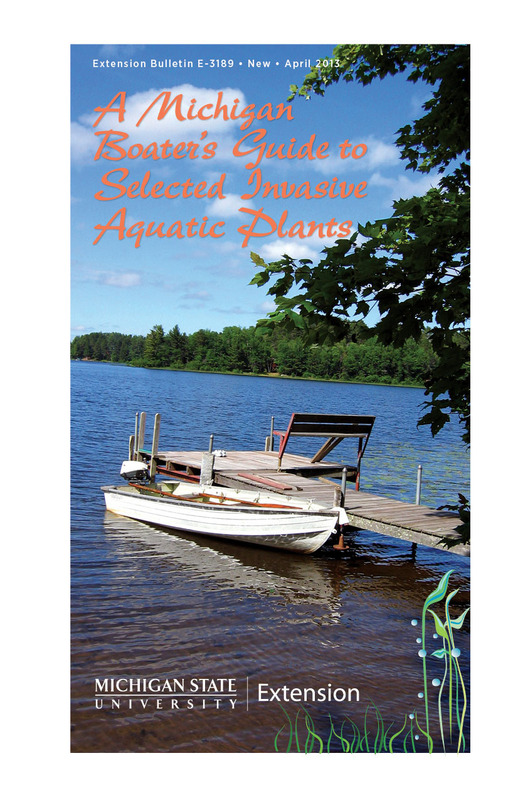 MSU fisheries and wildlife specialist Lois Wolfson and MSU senior Extension educator Jane Herbert co-authored A Michigan Boater’s Guide to Selected Invasive Aquatic Plants (E-3189). The small spiral-bound book was produced on water-resistant paper, making it perfect for a boater to bring along for the ride. Full-color photos assist in plant identification. Each of the 11 plants covered includes a description, habitat and distribution, and control and management. Boaters are encouraged to report invasive species sightings using the Midwest Invasive Species website at www.misin.msu.edu. Because removing the plants once they establish themselves is difficult, the book contains a section on prevention and monitoring so lake users can reduce the chances of an invasion and take immediate action if they do spot an unwelcome intruder. You can purchase the guide at the MSU Extension Bookstore. Read more in this ANR Communications news article and in this MSU Extension news article. I’m always happy to showcase our many successes in this blog and email. The increased attendance at the Michigan Natural Shoreline Partnership (MNSP) 2nd Annual Shoreline and Shallows Conference – from last year’s attendance of 94 to this year’s 152 participants – was just one of the measures of the event’s success. Fifty-one of this year’s participants were Certified Natural Shoreline Professionals gaining continuing education units through the MNSP. The intent of the certification program is to promote the use of green landscaping technologies and bioengineered erosion control on inland lakes. Lake management professionals, educators and lakefront property owners also participated in the conference. The conference took place during Agriculture and Natural Resources Week (ANR Week) March 7 in the Kellogg Hotel and Conference Center. Jane Herbert, Michigan State University Extension senior water resource educator, and John Skubinna of the Michigan Department of Environmental Quality (MDEQ), who facilitates the MNSP, served on the conference planning committee chaired by Lois Wolfson, outreach specialist in the Department of Fisheries and Wildlife, Institute of Water Research and MSU Extension. The conference focused on lakeshore restoration and the effect of climate change on plant selection and performance. The event featured various experts in the field including Dr. Mary Blickenderfer of the University of Minnesota Extension. Sponsors of the conference included MNSP; MDEQ, Water Resources Division; MSU Institute of Water Research; MSU Extension Greening Michigan Institute; Cardno JFNew; Michigan Lake and Stream Associations, Inc.; and the Michigan Chapter, North American Lake Management Society. MSU Extension provides leadership to the MNSP’s educational programming. MNSP is a public/private partnership and includes MSU Extension, the MDEQ, Michigan Department of Natural Resources, MSU Institute of Agricultural Technology, MSU Department of Horticulture, industry representatives, trade associations, other academic institutions and nonprofit organizations. The Michigan Water Withdrawal Assessment Tool (WWAT) recently won two national awards. The application won the Outstanding Achievement Award for 2010 from the Renewable Natural Resources Foundation. It also was one of four innovations to receive the State Program Innovation Award from the Environmental Council of States. What’s the WWAT? The WWAT is an application designed to estimate the likely impact of a water withdrawal on nearby streams and rivers. Use of the WWAT is required of anyone proposing to make a new or increased large quantity withdrawal (more than 70 gallons per minute) from Michigan waters, including all groundwater and surface water sources, prior to beginning the withdrawal. Why the WWAT? In coordination with the signing of the Great Lakes Compact, Michigan and the other Great Lakes states were charged with the mission of developing a statewide program to manage and regulate new and expanding large water withdrawals. Michigan responded by enacting new laws, several of which called for the development and use of a Water Withdrawal Assessment Process to manage large quantity water withdrawals. Using science as the basis for policy development, a team of scientists and agency personnel developed the process to assist individuals in determining if their proposed large capacity water withdrawal will likely cause an adverse resource impact to a nearby river or stream. Who’s responsible for the WWAT? That’s a complex question since so many people and organizations worked together to make the WWAT a reality. A number of individuals were associated with the development and “roll out” of the WWAT including members of the U.S. Geological Survey, the Michigan Department of Natural Resources, and scientists from the University of Michigan and others. A Legislated Ground Water Advisory Committee worked on this effort for several years. Our own Michigan State University Institute of Water Research (IWR) has played a key role in several steps of the legislation and assessment process. Prior to the legislation on the Water Withdrawal Assessment Process being passed, Jon Bartholic, director of the IWR, provided testimony to the state Senate Natural Resources and Environmental Policy committee and worked with Senator Patty Birkholz’s committee on public hearings throughout the state. Jeremiah Asher, IWR, created the Web-based tool. Following the development of the tool, David Lusch, senior research specialist, MSU Center for Remote Sensing and Geographic Information Science and IWR, and Jeremiah Asher were the two main presenters at a series of workshops throughout the state. Lois Wolfson and Ruth Kline-Robach, Michigan State University Extension state water quality coordinators, organized and evaluated the meetings. In addition, MSU Extension educators were hard at work presenting other educational meetings and programs. Roberta Dow held a meeting on the WWAT as part of the MAEAP Phase I. Lyndon Kelley and Christina Curell presented WWAT information as part of four separate Extension education programs. Others who held meetings on the tool included Terry Gibb and Bindu Bhakta. Jane Herbert, MSU Extension at Kellogg Biological Station, and Luke Reese, Department of Biosystems and Agricultural Engineering at MSU, organized a webinar with David Lusch as the speaker. Paul Seelbach, formerly with Michigan Department of Natural Resources and Environment and Jane Herbert developed a bulletin of frequently asked questions (Extension Bulletin WQ60) concerning the Water Withdrawal Assessment Process, Considering Aquatic Ecosystems: The Basis for Michigan’s New Water Withdrawal Assessment Process. So as you can see, it took a considerable team across multiple agencies and with a variety of expertise to make this award-winning process and application possible.